The skyline of Amsterdam, from the Central Station towards the river IJ seems to have different connotations, recently. 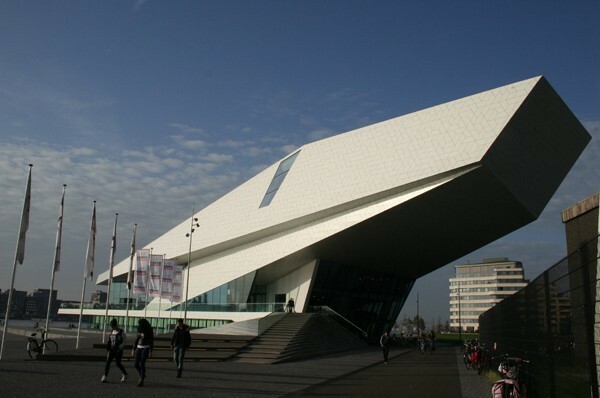 The EYE, a huge white sculptural form, now marks out the waterfront of the city, relating itself with the modern architecture of the surroundings and becoming, at the same time, a contrasting element of it. 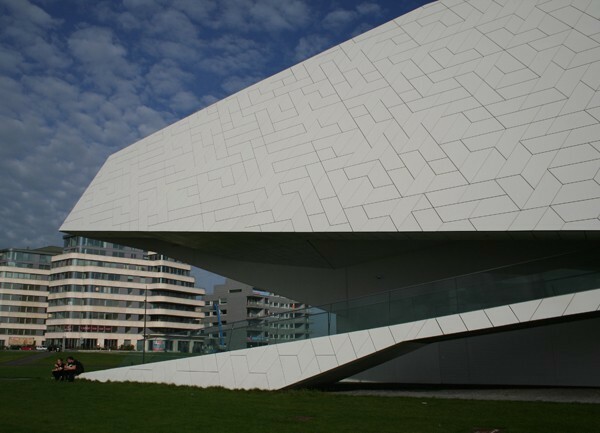 The Film Institute embodies a completely new architectural concept, full of ideas and high quality formal solutions. While, the riverbank’s landscape and the typical Dutch light, due to the water, create significant spatial perceptions and city relations, which contribute to a social surplus value of the area, formerly property of the Shell with its Overhoeks Tower, nearby. Thus the communicative presence of the new building goes beyond its confines, by transforming the visit to the Film Institute into a prolonged encounter between actual reality and cinematographic fiction. The studio Viennese Delugan Meissl Associated Architects (DMAA) has two objectives: to enhance perspective’s perceptions of the volume on the north shore of Amsterdam and assess its impact on the visitor who reaches it gradually aboard a ferry. 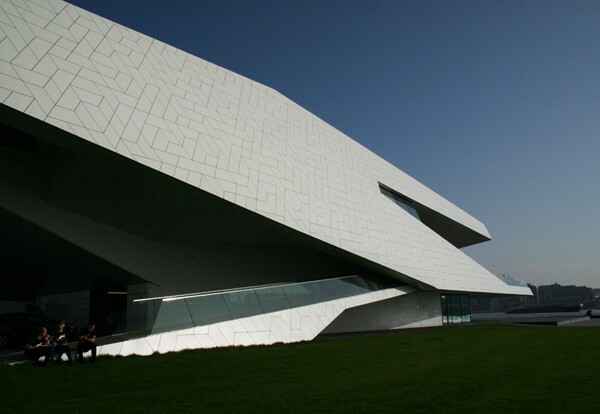 From the urban point of view, however, up to the most intimate interior, the visual and spatial connections are the means by which the architecture results in sensory awareness, as well as the cinema, which articulates the strings of our inner emotions. There are no sketches or ideas drawn on paper to give an impression of what the authors want to achieve: it all happens on an experimental basis through mental exercises solicited from video files, such as movies that tell a preview of the new architecture and the role that it will personify one day. Thus, the office DMAA won the competition by the assumption that either films or architecture constitute a filter on realness. In our case, manipulating light through space and matter, while the film, which is no longer the object to be displayed inside a showcase, becomes the device, which the architecture sets its own sceneries with, by unfolding itself along its environs. 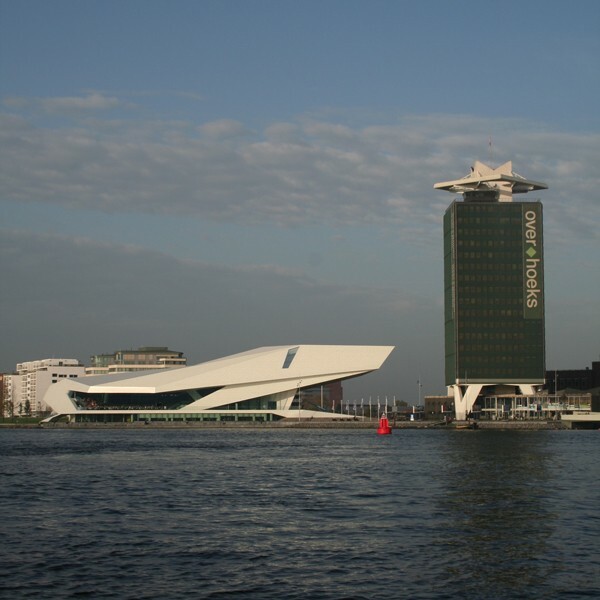 The exploration of the institute begins from the Central Station Amsterdam-North: just outside, the visitor can not help but be curious about that white shape that juts out over the water. Is it a boat or a stylization of a seagull? Its outlines become familiar as soon as you get closer to the shore, and then, interpret it according to your personal evocations. A long-stretched access ramp lined with wooden slats invites to enter the museum and branches out, along the side of its inclined volumes, creating a wide terrace, hanging over the water. Piers lay down to the surrounding lawn and, as tunnels, open up perspectives on imposing architectures standing on the other side of the river, allowing the passage of the numerous tourists who come along, driven by the desire to know the place and the new Film museum, in full freedom. The routes on the outside running through the building and the beautiful sights on the landscape, all around, are just a small anticipation of the dynamism that characterizes the essence of the project. The Film Institute almost becomes a pretext for visitors to experience other images, those ones that alternate outside the cinemas and which focus on the EYE from different sites, there in the vicinity. So, after the show itinerary, you get suddenly into a narrow corridor from which, you catch a glimpse to breathtaking views of the city on the water, whose façades overshadow by the passage of slowly vessels that transit thought the canal. The restaurant and the coffee shop, both adjacent to the external piers, find their location just inside the central hall, called Arena, by the same architects. Irregular stairs, instead, surmount the openings towards the entrances to the different theatres and exhibition spaces, like in an out-and-out amphitheatre. 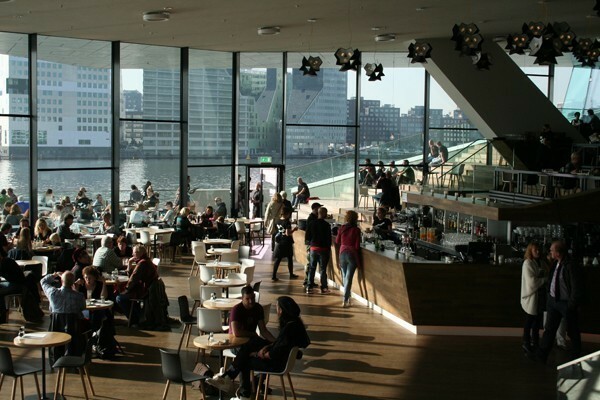 Therefore, on the wooden steps you can sit and enjoy the spectacle of the IJ twinkle through front and side windows, as light veils between the large volumetric cuts made by the designers. The Arena is not just a place where to meet, but a rest stop, an exhibition space, one of the scenes into a movie theatre. The angularity of its form reveals the ability to use even a single inch of every corner that determines it, which are not leftover spaces but areas deliberately so designed to counteract the regularity of the projection rooms. Therefore, in the Film Institute EYE in Amsterdam dynamism and stop, transparency and matter, inner and outer, are no longer dichotomies. The boundary between the one and the other thing is so thin as to be fleeting, just like a blink. The same as a camera photo shoot, that imprints remembrances in our visual memory, even before any true reproduction.